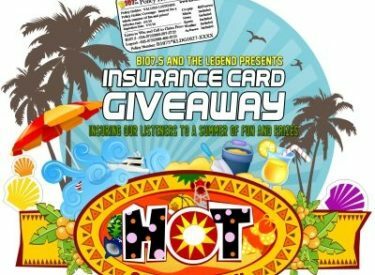 B107.5 and the Legend are insuring you a summer of fun and prizes. IMPORTANT!!! – WHEN FAXING COPY OF CARD YOU MUST PUT ADDRESS ON COPY SO WE CAN MAIL THE CERTIFICATE TO YOU!!! IF YOU’VE SENT ONE WITHOUT ADDRESS YOU NEED TO RESEND COPY!! When you arrive at the park you’ll register your policy number and drop it in the drawing box. Only ONE registration per card. KEEP your card on you! From 10:30 to 11am come by and check your insurance card numbers against the list of numbers that were called this summer – if you see your number you have until 11am to claim your prize – otherwise we will give those prizes away to the people present at the park! At 11:30am we will draw ONE number and let that person pick from the pile of money bags and hopefully they will find the ONE bag with $10,000. If not selected on that 1st pick, that bag will then be worth $1,000 for the lucky person who DOES find it! We will then draw 99 more numbers and each bag contains a # that corresponds to a prize. Good Luck & Have Fun!